Britain's status as a global design leader has been given a boost with a new scheme to fund research into design to help society. The Design Star Consortium has been awarded £2.2million by the Arts and Humanities Research Council (AHRC) to fund around 60 PhD researchers over the next five years. The award - which will be matched with a similar amount by universities - is one of 11 new long-term funding partnerships announced by the AHRC today (15 October 2013). Design Star is led by the University of Reading in collaboration with Loughborough, Brighton, Goldsmiths and the Open University. It is hoped the scheme will develop the design research leaders of the future, equipping them with the research skills and knowledge to improve design across sectors including environment, transport, democratic participation, science and technology, healthcare, and creative production. Professor Sue Walker, University of Reading, who led the bid said: "Britain has built a global reputation on great design - from Stevenson's Rocket to the Tube map, the Mini and, more recently, the award-winning ‘gov.uk' website. By helping the next generation of design researchers, we hope to create a new wave of design innovation. "We are delighted that AHRC has agreed to fund Design Star. We believe our students will become design researchers who are confident in tackling real-world problems through working in teams that cross traditional subject disciplines, and in communicating widely about what they do. "By studying the history, theory and practice of design, they will be able to carry out the very best kind of research - that which leads to improvements in the ways we live our lives every day." For more information for media please contact Pete Castle at the University of Reading press office on 0118 378 7391 or p.castle@reading.ac.uk. Brighton's Faculty of Arts has played a significant role in design and design historical research since the late 1970s with its first doctorates in these fields. More recently, complementing research into design policy, design education, design management and innovation, sustainability and the design profession, much design research at Brighton has been characterized by inter-disciplinary investigations in science and engineering, medicine and business, and architecture and the environment. Design at Goldsmiths is renowned for its research in sustainability, interaction design, design learning and assessment, critical practice and design futures. Operating in the midst of distinctive social science, humanities and arts Departments, it has a distinct critical edge in its recognition of the ways design is implicated in cultural formation and the concomitant responsibility of designers in these processes. Research in the Loughborough Design School is vibrant and world class, attracting external funding exceeding £3 million each year and is dedicated to advancing knowledge in a wide range of areas by combining appropriate specialists and facilities from a particularly broad spectrum of designers. There are well established strengths in user-centred design, design technology, human factors, sustainable design, transport and safety research, design education, and design engineering. Design at the Open University has established an outstanding reputation for innovation in research and distance learning since its foundation in 1969. The department's research is characterised by a focus on the more generic aspects of design across disciplines - for example, processes, grammars, modes of thinking, management, and decision-making - which play out across our key thematic areas in sustainable design, complexity, and design processes and products. The Department of Typography & Graphic Communication at the University of Reading has an international reputation for research in the theory, history and practice of ‘design for reading'. Since the late 1960s, it has developed an entirely new university discipline that blends an understanding of language, the craft tradition of printing and newer digital technologies, perception, aesthetics, project management, social and economic history, education and the graphic arts. 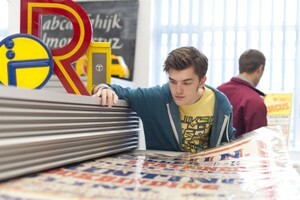 The Department's excellence was affirmed in 2012 through a Queen's Anniversary Prize marking ‘a world-leading centre of typographic teaching and research'.